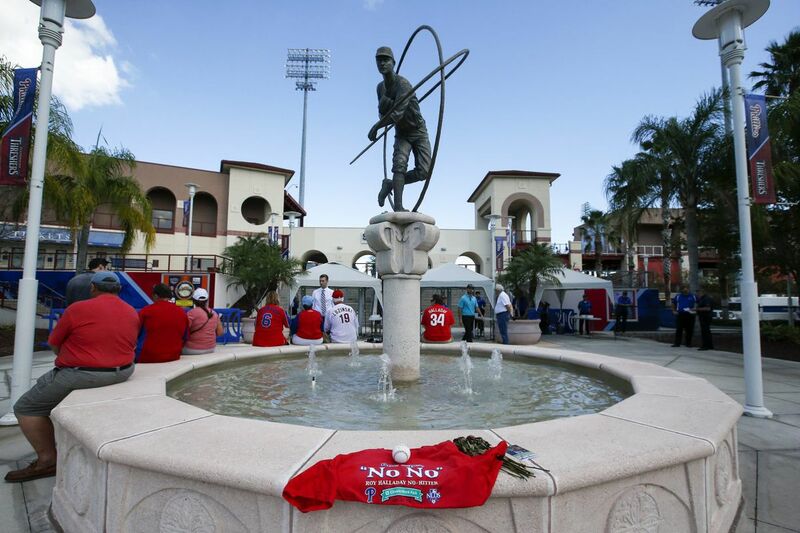 Fans wait outside Spectrum Field in Clearwater, Fla., before the start of the celebration of life for Roy Halladay. A public memorial service for former Phillies pitcher Roy Halladay was held Tuesday at Spectrum Field in Clearwater, Fla., the Phillies' spring training home. The service came a week after the stunning plane crash that killed the ace hurler, a Philadelphia fan favorite. Watch video of the service below, accompanied by reporting from our Matt Gelb, who was at the event. Speakers included Halladay's wife, Brandy, and father, Roy; former Phillies teammates Cole Hamels and Chase Utley; former Phillies manager Charlie Manuel; Phillies co-owner John Middleton; former Blue Jays general manager JP Ricciardi; and pitching contemporary Chris Carpenter, against whom Halladay dueled in game 5 of the 2011 National League Division Series.